Yoga and meditation is the best natural treatment for the people for their mental and physical fitness and to get rid of the chronic disease who are tired visiting to the doctors and taking allopathic medicines. For the result-oriented yoga and meditation we need very quiet places. We have hills, mountains and rivers in Nepal that are very effective factors of yoga and meditation. There are many monasteries in Nepal where the yoga and meditation can be arranged in a peaceful environment. Yoga and meditation package can be shorter, about one week, and longer based on the interest, need and problem of tourists. There are different types of yoga and meditation and professional yoga and meditation teachers in Nepal. Nowadays, yoga and meditation in Nepal are very popular and highly preferred by tourists from different countries. Yoga and meditation can be done during the trekking, cultural tours, rafting and study and social tours at the camp sites. At the rafting area yoga and meditation are very effective as they are done at the edge of the river or near by the waterfalls from the hill. Note: Yoga and meditation package can be shortened and extended based on the interest of the tourists. It can be arranged also out of the Kathmandu valley. Tour Leading Person: Our tour guide will lead the whole trip with his/her helpers and porters. Altitude Sickness: Altitude sickness will start from 3000 meter height. Tourists should immediately inform tour guide if faced any problems. Drinking Water: We can get mineral water and boiled water in city area and in some touristy places. We use water purification tablet or liquid in some remote touristy sites. Laundry Facility: Laundry facility are available in city area. Orientation Program: Before starting trip, tourists are provided with an orientation by our office representative or tour guide about the necessary tour information. Accommodation: You will stay in a 5***** to nice tourist standard hotel/resort in city areas. Normal hotels also are available during the tour upon your desire. Foods: We provide breakfast, lunch, dinner. Tourists can get continental food both in city and touristy areas. View of Mount Everest: For tourists visiting other regions where they cannot view Mount Everest, there are daily mountain flights which approach close to Mount Everest. Luggage: Your excess baggage will be stored in a hotel. 1. If the balance payment is not paid before your departure for trip, the booking will be cancelled without any refund. 2. If there is war or the situation of the country is out of control and the country faces emergency situation before your arrival to Nepal, we inform you not to come Nepal and refund your payment. But in case of any emergency situation or war after your arrival or during the tour, we will not refund your money. But we will try our best to make your trip successful and pleasant. 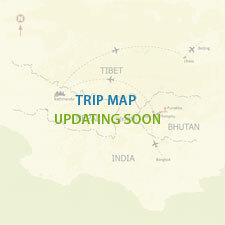 In such situation, we may need to change the trip plan and itinerary. 5. If you have any complain with regards to trip, please inform our tour leader or company. All kinds of valid complain are welcomed and processed with necessary actions.